KQ to offer shuttle bus services to airport at Ksh 1000 – Kenyatta University TV (KUTV). All Rights Reserved. Kenya Airways, KQ, has entered city bus business through its shuttle buses in a move meant to somewhat ease the financial burden that the carrier is currently facing. The shuttle buses, which will be charging Shs 1000, are expected to offer competition to taxis that currently charge more than Sh2,000 for the journey. “Spacious KQ shuttle buses now leave from the Sirios Car Park on Loita Street CBD, whisking you to JKIA in comfort and style,” the notice read. “Why go through the hassle of finding your own way there when we will take you for just Sh1,000 one way?” Said the notice in a question form. The buses will depart from the central business district at 6am, 11.00 am and 5:00 pm. 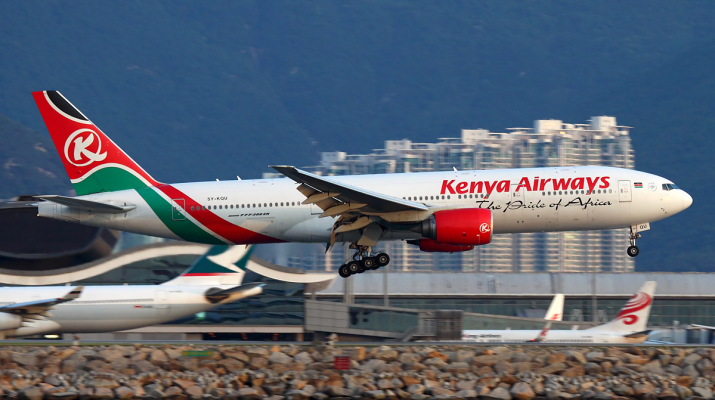 They will depart from JKIA to the city centre at 9:00am, 2:00pm and 9:00pm local time. The shuttles will allow passengers two pieces of luggage and a carry-on bag. The firm is currently working on a turnaround strategy that includes staff rightsizing, and rationalising its fleet through selling off and leasing some of its surplus aircraft. The Sh1, 000 charge is 900 more above the Sh100 charged by public service vehicles that operate from the CBD to the airport, with the cost of using Uber Taxi estimated to be between Ksh 870 to Ksh 1093 and even over Ksh2,000 for the other taxis. Kenya Airways announced a record net loss of Sh26.2 billion in the year ended March, widening the Sh25.7 billion net loss the year before. The carrier, which is part-owned by Air France-KLM, has been reducing its fleet, selling land and cutting jobs to recover from losses caused by a slump in tourism and the cost of renewing its fleet.